During 1963 Decca Records’ chairman Edward Lewis sold a substantial share of Decca’s interest to John Junor, editor of the Sunday Express. Junor was looking for a paper to print by four-colour printing developed by Woodrow Wyatt in Banbury, before printing the Sunday Express in colour. Junor moved Sunday Express production to Shaftesbury Avenue and New Record Mirror became more mainstream. In November 1963, the paper returned to the name Record Mirror, and featured a colour picture of the Beatles on the cover, the first music paper in full colour. Although the first run of 120,000 sold out, the following issue fell to 60,000. Junor replaced Jimmy Watson by Peter Jones. Circulation recovered and the paper successfully continued with the same format throughout the 1960s. Following acquisition in 1962 of NME by Odhams, Record Mirror was the only independent popular music newspaper. During 1969 Record Mirror was acquired by Record Retailer and incorporated into Record Retailer offices in Carnaby Street. The acquisition saw the magazine change printers, drop full colour pin-ups and increase its size to a larger tabloid format. 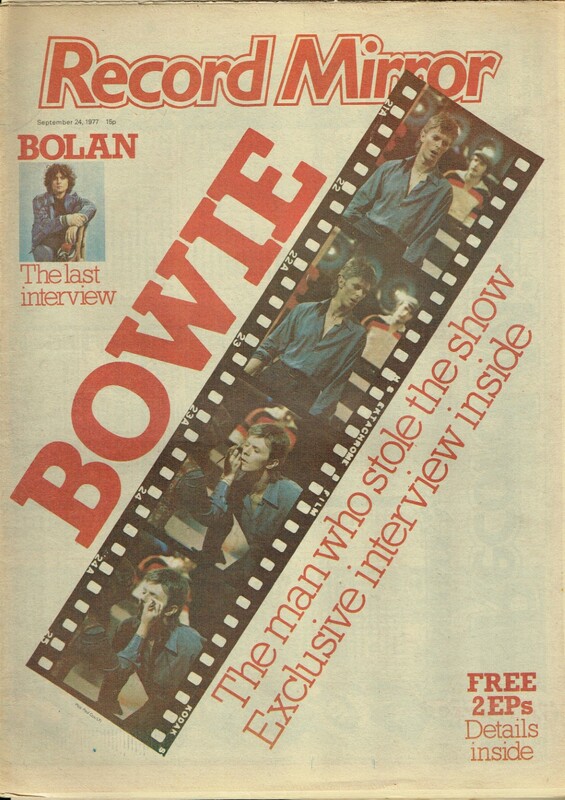 Jones continued as editor, supported by Valerie Mabbs, Lon Goddard, Rob Partridge, Bill McAllister (the first music journalist to herald Elton John and Rod Stewart), and broadcast-specialist Rodney Collins, who had moved from Record Retailer. Collins’s links with pirate radio gave Record Mirror a continental circulation and a Dutch supplement was frequently included. Terry Chappell resumed as production editor and Bob Houston supervised the change in format. Group editorial manager Mike Hennessey contributed the first interview with John Lennon. The Record Mirror photographic studio became independent, under Dezo Hoffmann. In a studio outtake of a recording of “Sally Simpson” on the 2003 release of the deluxe edition of the Who’s 1969 album Tommy, Pete Townshend said, “I’ve read the Record Mirror“. When Keith Moon presses him to tell what he read in the Record Mirror, Pete says, to the rest of the band’s laughter, that the paper said that he was known by the other members of the Who as “Bone”. In 1975 Disc was incorporated into Record Mirror – among the items brought to Record Mirror was J Edward Oliver‘s cartoon, which had been running in Disc for five years, and which continued for a two years in Record Mirror. By 1977 Record Retailer had become Music Week and Record Mirror was included in a sale by Billboard magazine to the Morgan-Grampian Group. Both offices moved to Covent Garden. Morgan-Grampian moved to Greater London House, north London in 1981.